Karine Massé obtained her doctorate on the murine nm23 gene family description and function analysis at the University of Bordeaux in September 1999. She then joined the laboratory of Pr E. Jones at the University of Warwick, England, and studied the early steps of kidney formation and the molecular mechanisms regulating this renal specification step. In 2003, she started a collaboration with Pr. 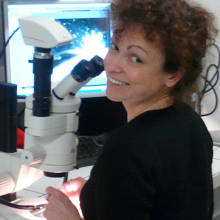 N. Dale to study the functions of the purinergic signalling during embryogenesis and we demonstrated that ADP triggers eye formation. Karine kept working with Pr. E. Jones on kidney formation and its regulation by the purinergic and lipidic pathways until being awarding an assistant-professor position at the University of Bordeaux in 2008. 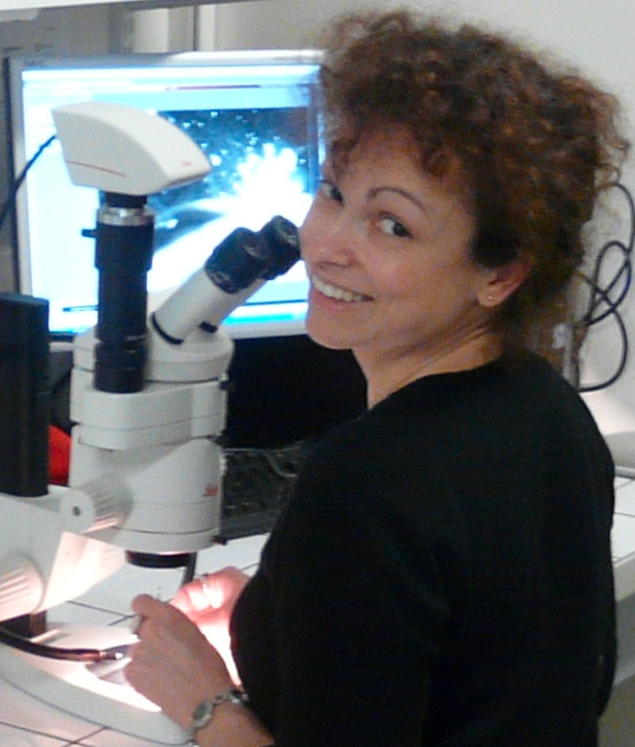 She developed within the group of P. Thiébaud (pluripotent embryonic cells and early differentiation steps in Xenopus) in the UMR-CNRS 5164 (CIRID), leaded by Pr. J-F Moreau, an independent research topic aiming to understand the functions of the purinergic signalling pathway during mesoderm differentiation. 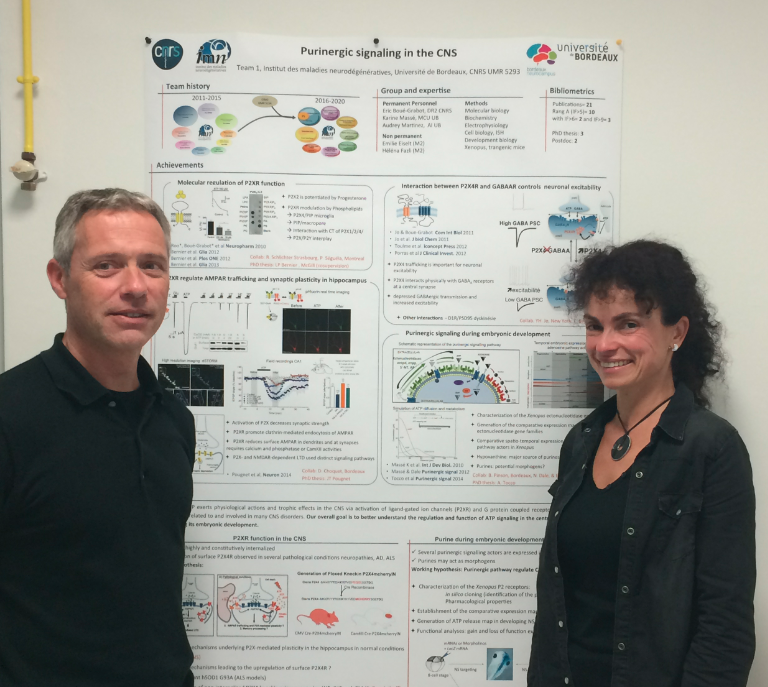 She recently joined Dr Eric Boué-Grabot in our lab to study the functions of the purinergic signalling pathway during neurodevelopment, especially during neurulation and neural specification. In order to decipher, in vivo, the functions of the extracellular purines, gain and loss function approaches are carried out in Xenopus embryo. The purinergic receptors and membrane-bound enzymes involved in purine metabolism are misexpressed and the effects of these gene expression deregulations analysed by diverse approaches. Pharmacological experiments by agonists or antagonists injections in the embryos are also performed to alter the purinergic signalling. 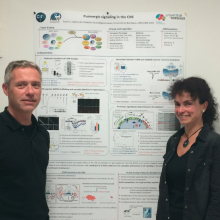 Karine will support her HDR entitled « La voie de signalisation purinergique et ses fonctions au cours de l’embryogénèse » the november 24th, 2015, 3:00 pm, in the meeting room at INCIA (Bâtiment 2A, 2d floor).